1. Take the ice cream out of the freezer and soften for 10 minutes. Meanwhile, tip 1 bag of Mini Eggs into a resealable bag and bash with a rolling pin until roughly crushed. Tip the ice cream into a mixing bowl and whisk quickly (you don’t want it to melt too much) until almost smooth. Stir through the Mini Eggs, return the ice cream to the tub and freeze for at least 4 hours, or overnight. 2. When you’re ready to assemble the sundaes, take the ice cream out of the freezer to soften for 10 minutes and warm the caramel sauce gently in a pan. 3. Place a spoonful of sauce in the base of a sundae glass. Top with a scoop of ice cream, spoon over a little more sauce, then top with another scoop of ice cream. Scatter over the remaining bag of Mini Eggs, either left whole or lightly crushed. Stick a wafer in each sundae and serve immediately. 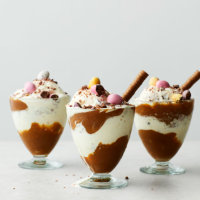 The joy of a sundae is that you can mix and match your ingredients. Add chopped nuts or fruit, or chunks of brownie, for extra texture. This recipe appeared within the April 2018 recipe card collection.